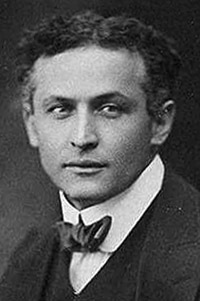 Born Erich Weiss, Harry Houdini was a world famous escape artist and trapeze performer, as well as the inventor of the diving suit, and the first successful aviator in Australia. Houdini was not alone among masonic magicians, a group which included such notables as Harry Keller, Howard Thurston, and Harry Blackstone. His untimely death has been the topic of much folklore: his burst appendix was not caused by an earlier blow to his stomach nor did he collapse on stage.